This post looks at the feasibility of the massive and rapid deployment of Carbon Capture and Storage and negative-emissions Bioenergy Carbon Capture and Storage technologies in the majority of IPCC scenarios that avoid dangerous global warming. Some observers question whether the deployment of these technologies at these scales and within the required time frames is achievable. This is Part One of a three-part series on the challenge of keeping global warming under 2 °C. The various emissions models that have been used to produce the greenhouse gas concentration pathway to 2°Celsius vary considerably, but the majority of them require huge deployment of Carbon Capture and Storage (CCS) as well as net-negative global emissions in the latter part of the twenty-first century. The only negative emissions methods generally considered in these scenarios are bioenergy capture and storage (BECCS) and land-use changes, such as afforestation. For there to be net-negative emissions, positive emissions have to be smaller than the negative emissions. Kevin Anderson (2015) (open-access text) reports that of the 400 scenarios that have a 50% chance or greater of no more than 2 °C of warming, 344 assume large-scale negative emissions technologies. 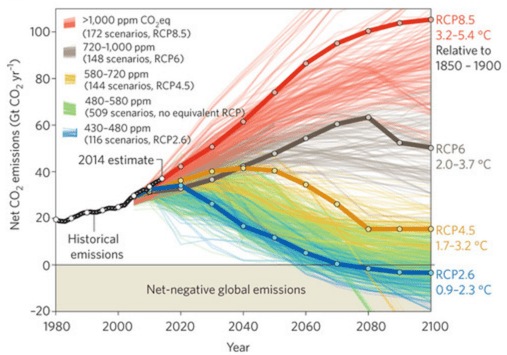 The remaining 56 scenarios have emissions peaking in 2010, which, as we know, did not happen. Sabine Fuss et al. (2014) (pdf) demonstrate that of the 116 scenarios that lead to concentrations of 430-480 ppm of CO2 equivalent, 101 of them require net negative emissions. Most scenarios that have net-negative emissions have BECCS providing 10-30% of the world’s primary energy in 2100. From Fuss et al. (2014), showing the historical emissions (black), the four RCPs (heavy coloured lines) and 1089 scenarios assigned to one of the RCPs (light coloured lines). The scenario modellers have come to rely on BECCS because some form of large-scale negative emissions technology is economically optimal and BECCS provides, for now, the only plausible method of achieving that end at the scale required. CCS as a mitigationtechnology has limitations in that it is currently only 85-95% efficient at removing CO2 from a power plant (Scott et al., 2013), it does not work for non-stationary CO2 sources like ships and aeroplanes, nor for many agricultural emissions. To get even to zero net emissions (and get there we must to avoid >2 °C warming), negative emissions technologies are necessary. And to correct for emissions overshoot before 2050, net negative emissions are required in the latter half of the century, requiring an even bigger deployment of BECCS. BECCS at the large scales envisaged in many scenarios, will place huge demands on land use, with important consequences for food security and biodiversity. The use of bioenergy in Europe, which currently makes up half of the renewable energy used in the EU, is already causing major land-use impacts in the SE United States, as outlined in the excellent series of articles titled Pulp Fiction by John Upton at Climate Central. Just one region of the world relying on biomass for ~6% of its primary energy is already causing land-use problems outside its borders. Upton points out that the use of biomass in Europe hinges on assumptions that it is carbon-neutral. The climate impact of wood burning depends to a great deal on the type of wood used, as this UK Department of Energy and Climate Change report shows. It depends, for example, on whether the wood comes from harvesting of natural forests that would otherwise remain untouched, or whether the wood comes from waste from logging operations that would have happened anyway, or any number of other scenarios in between. It also matters what time period the impacts are measured over. It’s complicated, in other words, but whatever the scenario, the GHG impact of biomass burning is not zero. In some cases, the impact can be worse than coal. Putting aside, for now, the important issues of land-use and bioenergy emissions, let’s look at the feasibility of the “S” in CCS and BECCS: storage. The following graphs are derived from the scenario described in Van Vuuren et al (2011). Some are taken directly from the paper, but I have generated others myself, based in part on information kindly provided by Detleff van Vuuren. I have made a number of assumptions in my calculations, and the graphs and numbers I have generated myself are just back-of-the envelope quality. Showing global primary energy use (in ExaJoules) for the RCP2.6 scenario. From Van Vuuren et al. (2011), part of their Figure 2. The total energy consumed doubles from 2010 to 2100. Over that period bio-energy use increases five-fold and, after 2020, the use of CCS and BECCS increases dramatically to make up roughly half of the energy supply. Let’s rearrange that graph to look at fossil fuels only. 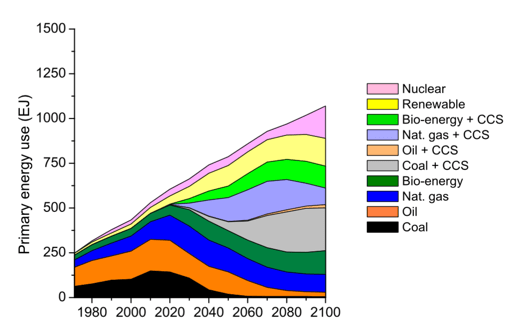 This graph shows the huge mass of CO2 that will need to be stored in disposal sites by the end of the century from fossil and biofuels under this scenario: about four times the total mass of fossil fuels produced in 2000. The fourteen CCS plants currently in operation on average sequester 2 million tonnes of CO2 per year, so we would need 20,000 such plants running by 2090. (Incidentally, only three of these current projects are not dedicated to enhanced oil recovery.) Between 2030 and 2080, this would involve adding roughly one 2-million tonne plant every day. Future CCS plants are likely to be much bigger than the current demonstration projects, but even if they have an average capacity of 10 million tonnes per day, that would involve building one big facility every five days for fifty years. If we assume a cost of $50/tonne for CCS, this will entail a cost of $2 trillion per year by the end of the century, an amount that exceeds current global military spending. Looking at the mass gives an impression of how much CO2 needs to be handled at the surface, but does not tell us much about the volumes that need to be sequestered back in the Earth. When CO2 is stored at typical temperature and pressure conditions it will be in the form of a super-critical fluid with a density of roughly 0.6 gm/cc. Natural gas in areservoir at a depth of 2000m will be compressed approximately 180 times. This factor depends on the specific temperature and pressure of the reservoir as well as the chemical composition of the gas, so this is just a rough figure used for illustrative purposes. By the end of the century, under this scenario, we would therefore be sequestering 50 billion cubic metres of CO2 from fossil fuels every year with an additional 15 billion cubic metres from biofuels. For comparison, this is about three times the volume of fossil fuels extracted from the Earth in 2010. Expressed another way, that’s equivalent to disposing of the volume of Lake Erie underground every 7 or 8 years. Human sequestration of CO2 will exceed the natural oceanic uptake sometime in the mid-century. Pumping this volume of fluid into the subsurface is going to have consequences. There are very few underground voids waiting to be filled and existing fluids, mostly brines, will be displaced. They will have to find their way to the surface somehow. 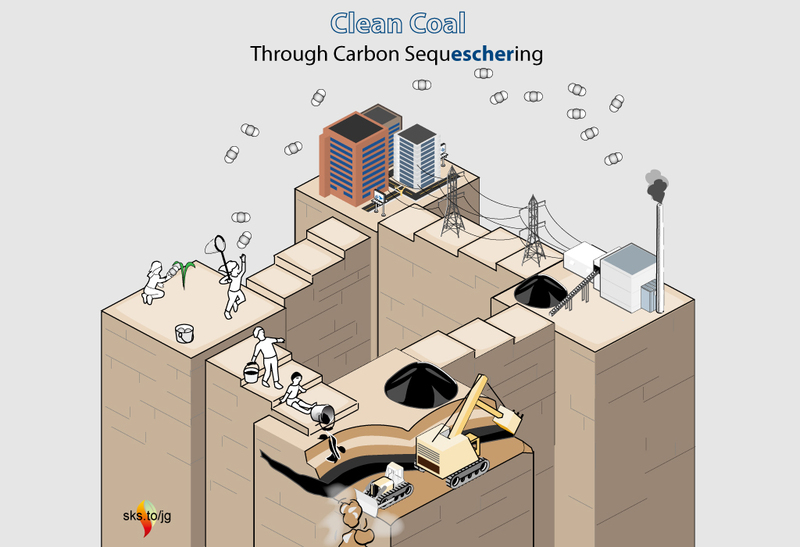 Many potential risks associated with CO2 sequestration have already been identified and although some of these can be avoided with careful site selection, monitoring and engineering, at the scales required by most 2°C scenarios, there will inevitably be sites selected for CCS that are less than optimal. Vaclav Smil has made similar observations about the masses and volumes associated with significant CCS. In this video he outlines the difficulty of adopting large-scale CCS adoption over just a few decades. Recently, Shell has started a CCS project in Alberta that they have called Quest that plans to extract 1 million tonnes per year of CO2 from the exhaust of a heavy oil upgrader and then pump the CO2 into the basal Cambrian sandstone layer. This is a promising project, although emissions for Alberta’s upstream oil and gas industry in 2013 were 73 million tonnes of CO2e, so approximately 70 such plants would be required to render the upstream petroleum industry carbon neutral. The project receives generous government grants and the estimated cost is $72 per tonne. Let’s hope it works and that projects like this can be repeated safely and more cheaply. Governments have made some token efforts to support pilot projects in CCS, but many initiatives have fallen through. The fossil-fuel industry stands to gain doubly by an expanded CCS industry, since it gives extra life to their assets and, because they have expertise with handling fluids in the subsurface, they will capture most of the investment required to dispose of CO2. Nevertheless, private industry research efforts are half-hearted at best and are mostly limited to EOR projects. 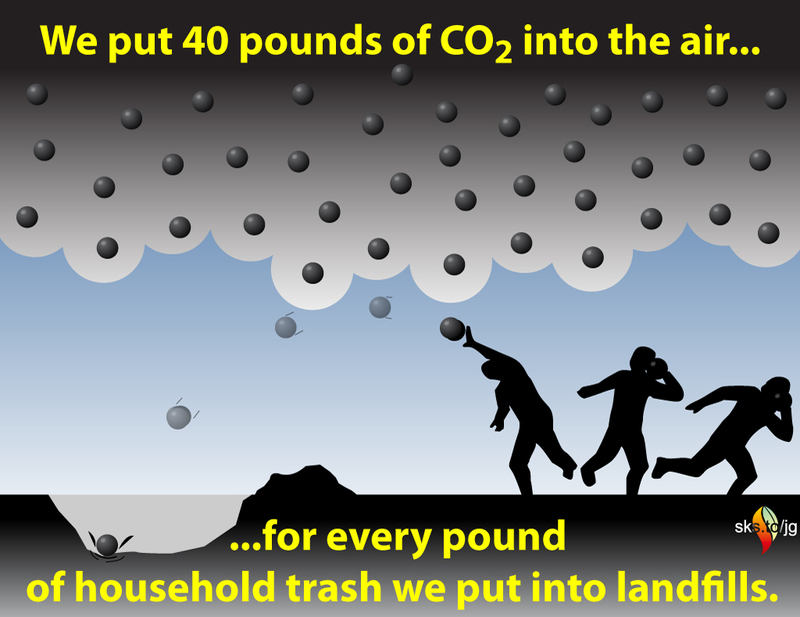 There’s an element of absurdity to processes that dispose of CO2 only to produce more fossil fuels. None of this discussion should be taken to imply that CCS or BECCS technologies will play no role in mitigation, it’s just that relying on them to dispose of tens of billions of cubic metres of CO2 in the latter half of the century does not seem to be prudent. CCS at this scale is not the only path to 2 degrees and we will surely have to push energy demand reductions, solar and wind energy and nuclear energy as hard as we can if we are to to ensure avoiding dangerous climate change. Even if the scenario laid out by van Vuuren et al. did unfold as they imagine, the job of the CCS/BECCS solution for avoiding dangerous climate change would not end in 2100. Unless the energy supply is replaced by a genuinely sustainable source, we will be stuck on a treadmill of digging up carbon and putting it back. The cycle will have to continue until we run out of resources to burn or space to sequester the CO2. In the long term, this is not a solution but a stop-gap. There is a massive disconnect between what the modellers say we have to do and what we are actually doing. We won’t solve the problem if we don’t acknowledge how huge the challenge really is. Scott, V., Gilfillan, S., Markusson, N., Chalmers, H., & Haszeldine, R. S. (2013). Last chance for carbon capture and storage. Nature Climate Change, 3(2), 105-111. In the second part of this series, I will look at a recent paper by Kevin Anderson, who argues that climate scientists and policy makers have been less than candid about the level of difficulty that we all face in avoiding dangerous climate change. This entry was posted in Uncategorized and tagged BECCS, Mitigation. Bookmark the permalink.